Reiki (pronounced Ree-Kii) is a very ancient healing method that was mentioned in the ancient Sanskrit Sutras more than 2,500 years ago, and was used in the 19th century by Dr. Ing. Mikao Usui, a Christian monk from Japan. Since then, the Usui system of Reiki is also used. A Reiki treatment usually lasts sixty minutes, sometimes up to ninety minutes. The person being treated lies on a comfortable base, and the practitioner places his hands in various positions on the body of the person to be treated. The treatment always starts at the head and is continued via the upper body and back. This treatment usually has 12 to 21 positions. In each position the hands of the therapist remain for three to five minutes. When the practitioner hangs up his hands, they do not release their own energy, but pass on the energy they have received through their hands. How exactly Reiki works? It is not known until today. At least there is no scientifically substantiated answer. Every practitioner has their own explanation. In most cases, when the hands are put on, most people feel a soothing warmth, which spreads throughout the body during the course of the treatment. By working with Reiki on your body, on reducing your stress, on your emotions, on your chakras, you will be able to find the full energy and the form to be able to move forward and act. 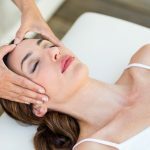 By working with Reiki you will be able to increase your self-confidence, your concentration skills, your power to be in your place and to assert yourself in what you do and say. As soon as you work with Reiki on emotional blockages, fears, traumas of the past, etc. you will free yourself from everything that does not really belong to you and that has been passed on to you by others without your knowledge. By freeing yourself from all of this, you give way to who you really are and so you can begin to live in harmony with yourself and those around you. You can live and create a personal and professional life that suits you and fully matches you. To heal, a person needs to connect with themselves, to give meaning to their life, to free their mind to find a deep joy that comes from inside them and which does not depend on external situations. Reiki will release blocked energy and transmute repressed negative emotions into creative energies. This goes through an internal process of relaxation. Reiki will help reduce the symptoms of depression by increasing endorphin production, stimulating the nervous system and adrenal activity. We can take a positive look at the suffering and consider it as an opportunity for change for our personal evolution.